We’re photographers who love to tell wedding stories. We’re a husband and wife team that really understands how important it is that your wedding is a fun, family celebration, and not a ‘photo-shoot’. We think you’ll love photographs that not only look beautiful, but ones that evoke beautiful emotions too. Others have described our photographic style as fun, natural, elegant and romantic. Our studio, in a converted stable, is on the outskirts of South Queensferry, just a few minutes from Dundas Castle. We’d love you to visit us, so we can hear all about your wedding plans and dreams, as well as your photography ideas. We can show you lots of our work, including albums of complete Dundas Castle weddings. The grounds around our studio, the building and even the beach are ideal locations for another feature of our service – A Pre-Wedding Shoot. It’s important to us that we get to know you a little before your wedding, so we offer all our clients a pre-wedding shoot (often known as an engagement shoot). At some point a few months ahead of your wedding day, we’ll spend time with you over a coffee, listening to you and learning all about the details of your wedding day. We’ll then head out with you for a walk and a chat whilst taking some photographs of the two of you. This is a great way for us to all get to know each other and for you to experience what fun having your photo taken can be. You’ll see how we work together, you’ll discover how to look your best. Some couples may start out a little apprehensive about this, but by the end of the short session they are loving it. Whilst we’ve photographed many weddings (for 2 people up to 350 people) all over the UK, weddings at Dundas Castle still are amongst our very favourites. 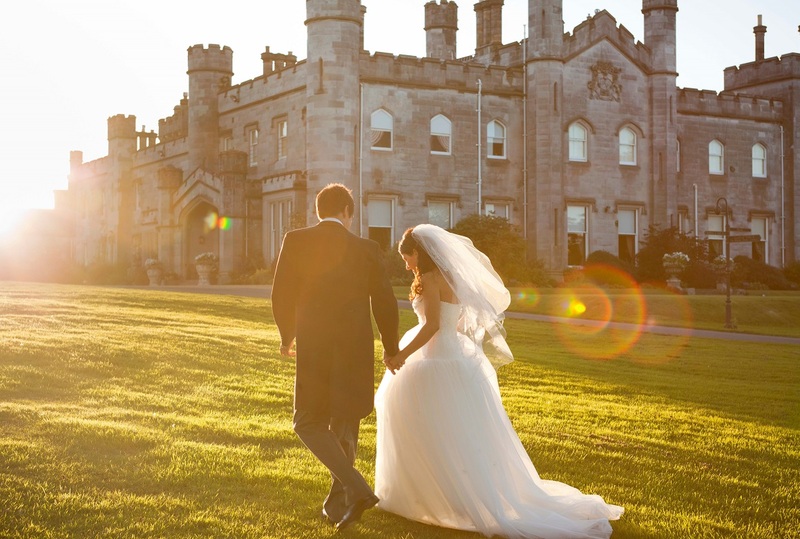 We’ve been a recommended supplier to Dundas Castle since 2003, so we know the castle and its surroundings very well. We’ve worked there in all weathers, all seasons and in all lights. We love every aspect of Dundas, from the warm, welcoming atmosphere and the historic grandeur, to the stunning grounds. But we especially love the people, who work hard to make every couple’s day the best of their lives. Combining all of this with our experience, results in beautiful photographs. We work closely with you and the team at Dundas to understand just how you’d like your day to flow, ensuring we fit into your schedule and are in the best places at the right times to capture all the fun and emotion. Our style of photography is designed around a desire to ‘capture the moment’ – with the occasional gentle direction, to ensure you and your guests look their very best! We like to follow your day from your preparations (Jackie with the girls and Alan with the guys), through to the evening celebrations, in a quiet and unobtrusive manner. These unique perspectives and the ability to be in two places at once with both a male & female viewpoint adds a depth and luxury to the photographic story we tell. After you return from honeymoon, you’ll enjoy reliving your wedding day with a personal presentation of your wedding pictures at our studio. We’ll spend time with you, showing you your pictures on the big screen, so you can see each one in detail. With our guidance, you’ll be able to select your favourites for your album. All of our albums are custom designed by Jackie and are made for us by the very best album suppliers in the world. Each album is hand made and is unique to you. You’ll even see a virtual version of this album, that you can flick through and request any alterations before it’s made. Each and every picture we show you will have been individually assessed, adjusted and edited by Alan. This is reflected in the outstanding quality of our prints. When celebrating your wedding at Dundas, make sure you plan as much time as possible into your day to spend with your family & friends, but be certain you keep at least 30 minutes to yourselves, to step back from the hustle & bustle, to savour the atmosphere and to enjoy a few moments together as newly weds. It is not only the event itself that is important to the team here at Dundas; it is also the memories that our clients have once they have left. Using photographs that have captured these memories is the perfect way for our clients and guests to relive the happy times that they have had here at the Castle. Our recommended photographers have been chosen specifically because of their product, service and the final album. Alan and Jackie Rankine’s photos are emotive, personal and absolutely beautiful but most importantly, as photographers, they are lovely people. Photographers are with the happy couple for a vast majority of the day so it is crucial that they have a good relationship. Dundas couples who have used Alan and Jackie as their photographers have only the warmest and most positive words to say about them and they are always delighted with their album.